The annual 99.9 Kiss Country Chili Cook-Off is coming up and is celebrating 30 years! The Chili Cook-Off 2015 event is being held at C.B. Smith Park 900 N Flamingo Rd in Pembroke Pines, FL. on January 25, 2015 at 10:00 a.m. Tickets are $52 per person and everyone who enters no matter their age will need a ticket. You will also need a parking pass that is $5 per car. Tickets are on sale now and can be purchased by going to www.wkis.cbslocal.com. Once on the website click on the tab that say Chili then click on buy tickets/parking. On the next page click on “click here to purchase Chili Cook-Off tickets”. There is a small service fee for each ticket purchased as well as for the parking passes. There are 22,500 tickets being sold so make sure to get yours before they’re sold out! 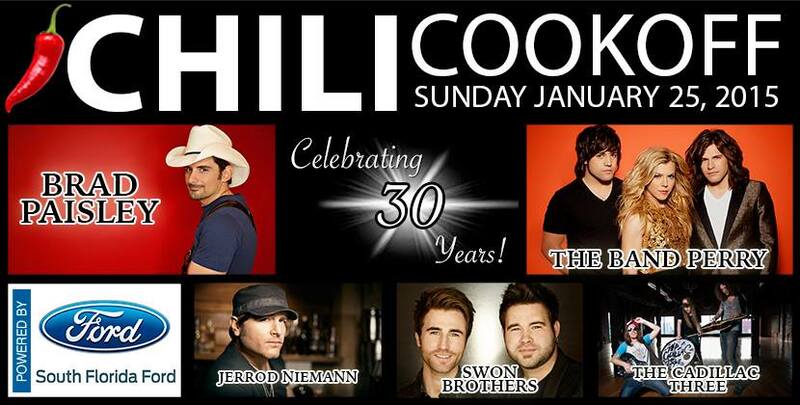 The lineup for the Chili Cook-off 2015 will be Brad Paisley who is headlining, The Band Perry, Jerrod Niemann, The Swon Brothers and The Cadillac Three. The Chili Cook-Off starts at 10:00 a.m. and ends at 5:30 p.m. on Sunday January 25th. The concert gates will open at 8:30 a.m., the parking gates on Pines Blvd will open at 1:00 a.m. and parking gates on Taft St. will open at 6:00 a.m. Handicapped parking will be available on Johnson St. as long as you have an official handicapped parking decal. You are not allowed to bring any cans, coolers, video cameras, flags or flag poles, weapons, umbrellas, backpacks or pets inside the event. Food and refreshments will be available for purchase once inside the Chili Cook-Off. This event will take place rain or shine and there are no refunds. C.B. Smith Park is located close to some beautiful communities in Pembroke Pines, FL. If you are looking for a home for sale or if you have a home you would like to sell contact The Teri Arbogast Team. Whether you’re buying a home or selling a home in Broward County, be assured that we will make your real estate experience a pleasant and profitable one. If you are attending the Chili Cook-Off 2015 in C.B. Smith Park have fun and enjoy the great music!